Does your mum always tell you to eat your fruit and veg? If you were a piranha, she wouldn’t say that. If you know anything about these hungry little fish, you’ll know that they love eating – nope, we can’t tell you. It’s too scary. 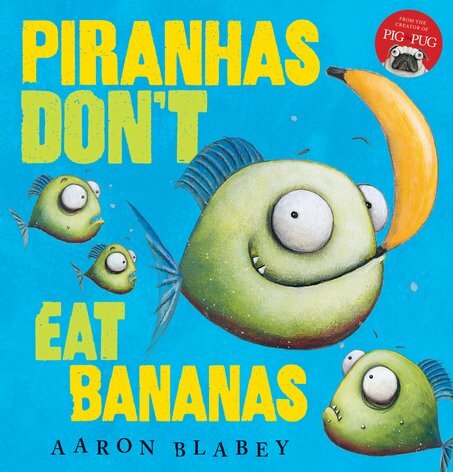 But there’s ONE piranha who has a different idea of what he’d like for dinner. Brian loves bananas! Yum! (And melons, apples, peas and plums.) Trouble is, his friends aren’t happy about his fondness for fruit. I mean, what would YOU rather eat? Bananas – or feet? AD340L Lexiles are the global standard in reading assessment. They are unique as they are able to measure a child and a book on the same scale – ensuring the right book gets to the right child at the right time.